Comprising a GROHE New Tempesta 100 shower, wall mount and shower hose, this set offers convenience and comfort for your bathroom. Make your shower more like a spa by choosing from two spray patterns: the Rain spray will delight you with the sensation of warm summer rain, while the powerful Jet spray invigorates. This is also the perfect aid for cleaning your shower or tub. 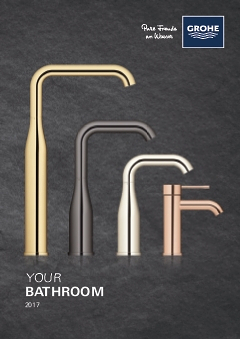 The GROHE StarLight chrome finish will add lustre to your bathroom. Our SpeedClean anti-lime system means no more worried about limescale build-up blocking your shower head. Thanks to the GROHE EcoJoy technology, your water use is capped at 5.7 litres per minute, thus conserving precious environmental resources while saving you money. And should you happen to drop the hand shower, the ShockProof silicone ring protects it from damage. The perfect choice.